Given accurate values for net primary productivity (NPP) in an ecosystem, and CE, AE and PE for the various trophic groupings shown in the model in Figure 17.22, it should be possible to predict and understand the relative importance of the different possible energy pathways. Perhaps not surprisingly, no study has incorporated all ecosystem compartments and all transfer efficiencies of the component species. However, some generalizations are possible when the gross features of contrasting systems are compared (Figure 17.25). Thus, the decomposer system is probably responsible for the majority of secondary production, and therefore respiratory heat loss, in every community in the world. The grazer system has its greatest role in plankton communities, where a large proportion of NPP is consumed alive and assimilated at quite a high efficiency. Even here, though, it is now clear that very high densities of heterotrophic bacteria in the plankton community subsist on dissolved organic molecules excreted by phytoplankton cells, perhaps consuming more than 50% of primary productivity as 'dead' organic matter in this way (Fenchel, 1987a). The grazer system holds little sway in terrestrial communities because of low herbivore consumption and assimilation efficiencies, and it is almost nonexistent in many small streams and ponds simply because primary productivity is so low. The latter depend for their energy base on dead organic matter produced in the terrestrial environment that falls or is washed or blown into the water. The deep-ocean benthic community has a trophic structure very similar to that of streams and ponds (all can be described as heterotrophic communities). In this case, the community lives in water too deep for photosynthesis to be appreciable or even to take place at all, but it derives its energy base from dead phytoplankton, bacteria, animals and feces that sink from the autotrophic community in the euphotic zone above. From a different perspective, the ocean bed is equivalent to a forest floor beneath an impenetrable forest canopy. in a variety of terrestrial and aquatic ecosystems. Figure 17.26b re-emphasizes how consumption efficiency by grazers is particularly low in ecosystems where plant biomass contains considerable support tissue and relatively low amounts of nitrogen and phosphorus (i.e. forests, shrublands and mangroves). 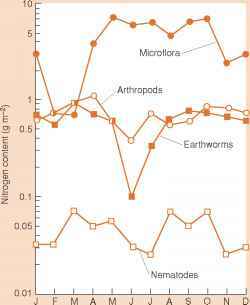 Plant biomass not consumed by herbivores becomes detritus and contributes by far the largest proportion to the dead organic matter (DOM) box in Figure 17.25. Not surprisingly, the percentage of NPP destined to be detritus is highest in forests and lowest in phy-toplankton and benthic microalgal communities (Figure 17.26c). Plant biomass from terrestrial communities is not only unpalatable to herbivores, it is also relatively more difficult for decomposers and detritivores to deal with. 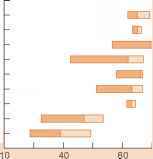 Thus, Figure 17.26d shows that a greater proportion of primary production accumulates as refractory detritus (persisting for more than a year) in forests, shrub-lands, grasslands and freshwater macrophyte meadows. Finally, Figure 17.26e shows the percentage of NPP that is exported out of the systems. The values are generally modest (medians of 20% or less) indicating that, in most cases, the majority of biomass produced in an ecosystem is consumed or decomposed there. The most obvious exceptions are mangroves and, in particular, macroalgal beds (which often inhabit rocky shores), where relatively large proportions of plant biomass are displaced and moved away by storm and tidal action. In general then, communities composed of plants whose stoi-chiometry represents a higher nutritional status (higher nitrogen and phosphorus concentrations, i.e. lower C : N and C : P) lose a higher percentage to herbivores, produce a smaller proportion of detritus, experience faster decomposition rates and, in consequence, accumulate less refractory detritus and have smaller stores of dead organic carbon (Cebrian, 1999). of organic matter. Figure 17.27 shows how GPP, RE (the sum of autotrophic and heterotrophic respiration) and net ecosystem productivity (NEP) varied seasonally during 5 years of study of a boreal aspen (Populus tremuloides) forest in Canada. Total annual GPP (the area under the GPP curves in Figure 17.27a) was highest in 1998 when the temperature was high (probably the result of an El Niño event - see below) and lowest in 1996 when the temperature was particularly low. Annual variations in GPP (e.g. 1419 g C m-2 in 1998, 1187 g C m-2 in 1996) were large compared to variations in RE (1132 g C m-2 and 1106 g C m-2, respectively) because the occurrence of warm springs caused photosynthesis to increase faster than respiration. This led overall to higher values of NEP in warmer years (290 g C m-2 in 1998, 80 g C m-2 in 1996). Note how NEP is negative (RE exceeds GPP and carbon stores are being used by the community) except in the summer months when GPP consistently exceeds RE. At this site, the cumulative annual values for NEP were always positive, indicating that more carbon is fixed than is respired each year and the forest is a carbon sink. However, this is not true for all ecosystems every year (Falge et al., 2002). The aspen forest discussed above is by no means the only ecosystem where annual variations in energy flux may be due to climatic cycles such as the El Niño-Southern Oscillation (ENSO; see also Section 2.4.1). 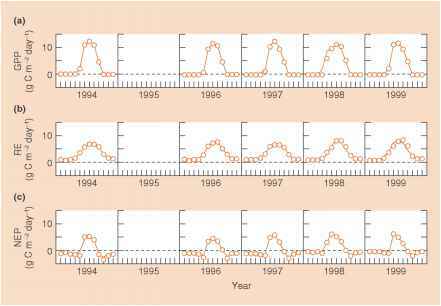 ENSO events occur sporadically but typically occur every 3-6 years. During such events, the temperature may be significantly higher in some locations and lower in others and, just as significantly, rainfall can be 4-10 times higher in some areas (Holmgren et al., 2001). The El Niño has been correlated with dramatic changes in aquatic ecosystems (even leading to the collapse of fisheries; Jordan, 1991). More recently, it has become obvious that the El Niño can cause major changes on land too. 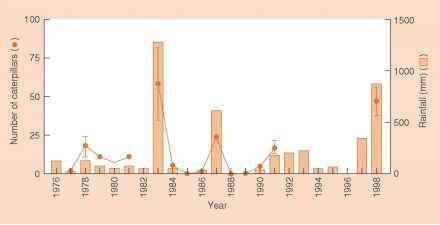 Figure 17.28 shows the annual variation in caterpillar numbers on the Galápagos Islands in a standard census conducted in various years since 1977, plotted on the same graph as annual rainfall. The remarkably strong correlation comes about because of the dependence of caterpillar numbers on primary productivity, which itself is considerably higher in wet years. We saw in Figure 17.20d how the total number of broods of the finch Geospiza fortis was much greater in the four ENSO years (open circles in that figure). This reflects the much greater production in very wet years of the seeds, fruits and caterpillars that they feed on. Not only do the finches increase the number of broods, but also the size of their clutches and the probability of successful rearing to the fledging stage. Our growing knowledge of the impact of ENSO events on energy flux through ecosystems suggests that the predicted changes in extreme weather events expected as a result of human-induced global climate change will profoundly alter ecosystem processes in many parts of the world, a topic to which we will return in Chapter 22. But next we turn to the flux of matter through ecosystems, recognizing that the rate at which resources are supplied and used by autotrophs and heterotrophs depends fundamentally on the supply of nutrients (Chapter 18). We shall see later how ecosystem productivity helps determine the consequences of competitive and predator-prey interactions for community composition (Chapter 19), food web ecology (Chapter 20) and species richness (Chapter 21). The Secret of A Great Lawn Without Needing a Professional You Can Do It And I Can Show You How! A Great Looking Lawn Doesnt Have To Cost Hundreds Of Dollars Or Require The Use Of A Professional Lawn Care Service. All You Need Is This Incredible Book!